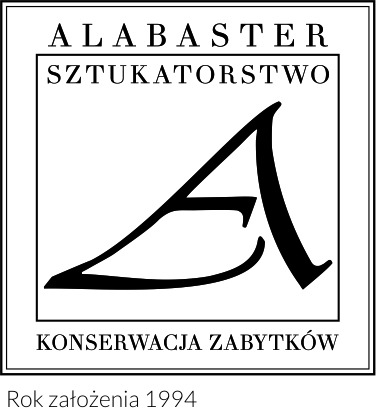 The firm „ALABASTER”- Sztukatorstwo, founded in 1994 by Miłosz Ciesielski, offers a range of services in the field of preservation, restoration and maintenance of historical buildings and architectural monuments. We specialise in stucco and plaster work, both exterior and interior. However, many years of wide-ranging conservation experience allow us to provide expert services on a spectrum of materials, e.g. stone, ceramics, brick and others. We have over 50 references from successfully completed engagements and an extensive photo gallery of our work. 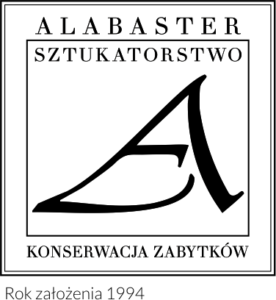 Mr. Ciesielski possesses a Conservator’s Diploma from the Fine Arts Academy of Nikolaus Copernicus University in Toruń and a Master Craftsman Diploma from the Szczecin Trade Guild, qualifying Alabaster to work on registered historical buildings and architectural monuments. We frequently provide our services in collaboration with other architectural conservation and construction firms, typically as sub-contractors on a project-basis. We have extensive work experience in Poland and have also worked abroad (mainly in Germany). The provision of our services through sub-contract arrangements has proven very effective, both for the main contractor and the end-clients, as it allows us to work flexibly and responsively in accordance with the needs of the particular assignment. We have our own means of transport and are able to work both on-site and in our own workshop which is equipped with all requisite tools, equipment and materials. We are seeking to expand our portfolio of clients and network of collaborating firms and are open to either short- or, especially, long-term cooperation. custom-design, production, painting and installation of new stucco elements (interior or exterior). Preservation, renovation and reconstruction of architectural elements and works of art (of stone, plaster, etc.). Cleaning and renovation of façades (ceramics, stone, brick, etc. ).